Perfect for customers who have trouble deciding whether they want their ice cream served in a cone or a dish, this Joy ice cream waffle bowl offers the best of both worlds! Family owned and operated since 1918, Joy is an old-fashioned favorite that continues today as the leading ice cream cone company. From mixing the batter to the baking process, quality and great taste is ensured with each and every Joy cone. A tasty waffle treat and clean-up is a breeze. The price is fair for the amount of bowls that one receives and the quality in taste. The Joy ice cream waffle bowl is a great way to serve ice cream sundaes and other desserts because its fun and you can eat the bowl too. Very tasty and fresh. These are great for ice cream parties! They can be set down and wont rip iver easily. The ice cream doesnt leak through easily or make them soggy quickly. And the bowls taste great. Great for a hot summer treat filled with ice cream. My kids and family love them and I love them because I dont have dirty ice cream bowls to clean! This Joy Ice Cream Waffle Bowl is the perfect light and crispy waffle bowl for a great sundae. It shipped without cracking, was able to hold a large sundae. Look great, but several sleeves came damaged. However customer service was very good and sent out new ones right away. Taste is good not like homemade though. The Joy ice cream waffle bowl is great and makes a great sundae. The waffle bowl is so fresh and low that you can eat the whole thing. A great quality product that is very sturdy and tastes great. I love serving in this edible bowl and guests love being able to eat the whole thing. It has a great flavor. We normally make waffle cones and bowls in our business, but purchased these waffle bowls for the customers that don't want to wait. Unfortunately they are to small for the intended purpose. However, they are crunchy and delicious. I have decided to use them as edible fruit bowls and the are great! They are packaged well and we haven't found a broken bowl yet. 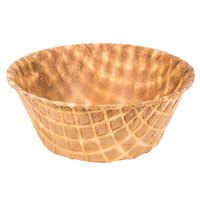 A wonderful ice cream waffle bowl that is a crowd favorite. The price is great and it makes a great bowl for ice cream sundaes. Sir Clean recommends this product Joy Ice Cream Waffle Bowl - 60/Case, its so crunchy and the flavor is fresh. We used in a ice cream party. A great waffle bowl that taste great and looks amazing. The bowls arrived with a few broken, but with shipping the delicate item I knew it was possible. The bowls are great for sundaes. Waffle bowls are a necessary offering at our ice cream stand. Joy products are consistently fresh and arrived unbroken. We use Joy cake, sugar, and waffle cones exclusively. These waffle bowls work perfectly for sundaes! They are just the right size. We have started using them in the restaurant part of our store and they are a hit! This is the best offer for these bowls that you will find anywhere online. I ordered them before from another site and it was quite expensive. They hold ice creams and any toppings well.Also they do not get sulky or weak when the ice cream melts. almost 50-75% of the 15 cases i ordered for an event were broken or damaged. Not a very happy buyer. I wouldn't order them again. They seem very flimsy too. We appreciate your review, David! A credit has been added to your account for the damaged product. Great packaging, never have opened a sleeve where they are broken. Perfect size for making sundaes in, packaged in a sleeve of 10. GREAT TASTE! So great for scoops of hard ice cream. The flavor of these is great and it's a unique spin on a traditional bowl for ice cream. These are good. They are perfect for ice cream sundaes. They hold the treat and then the bowl itself is edible, pretty presentation and no waste. Unfortunately, all of the waffle bowls came broken. I'm not sure if it was the delivery people or the company that packaged them. Future reference, package them better so they don't break. Thanks for the feedback on these waffle bowls! We really do appreciate our customer reviews. Our Customer Solutions team was happy to credit you for these. These were a tasty compliment to the carnival ice cream purchased. They will add a nice presentation for family or business function dessert, topped with your favorite topping and a cherry. Yum! First case we ordered was mostly broken. They replaced with no issues and these ones came together for the most part. Will probably get again. Customers seemed to like them once they realized we had them. Typically I doubled them just incase one decided to break. These waffle bowls are excellent. You get a great amount in the order and they are very fresh and good taste. They come with a freshness bag that you can put the open bowls in. although they cracked a little. But they were very useful. i will definitely order for my next part. i love them. my friends were impressed with the cup cone. you won't be disappointed.a must have at any kids party. What a great idea! My customers love this edible bowl filled with soft serve ice cream and fresh fruit on top. Very well packed for shipping. Very fresh and crispy. Absolutely terrible product. These waffle bowls are extremely delicate and break very easily. I've thrown away at least a dozen of these because they break as soon as i put a scoop of ice cream in it. The waffle cones aren't much better but they're not this bad. I still have two boxes of these left and I'm going to stop selling these. Great tasting ice cream waffle bowls! They are perfect for 2 to 3 scoops of ice cream. The price is great! I would recommend this product! These waffle bowls do not taste as good as the Keebler Brand but they do serve the purpose of holding ice cream and putting toppings. It is a good item for the cost, but I prefer others. These bowls are visibly not as attractive as the other waffle bowls I have used. These are about half the price so it explains the quality. Also they are little flimsy so easily brakes if you don't handle them properly. Yummy and fun for kids. I sell a bunch of these. Parents love them for their kids. Less mess and great taste. Not as fragile as I first thought they would be. Great product, the taste is wonderful. The customers enjoy reading the ice-cream from these waffle bowls. I would recommend this product to anyone who ask. These waffle bowls are great , even better than the cones because these don't drip like the cone does , i totally recommend these ! The fun of a waffle cone in a bowl form! It's great to be able to have a sundae in a waffle cone. It also holds a lot. these bowls are great they hold a lot of ice cream. they hold up real good to the ice cream don't get soggy and they have a great price. I love waffle cones and this waffle bowl makes it easy to incorporate the unique texture and flavor of waffle cones into a sundae! Each bowl holds a lot of ice cream!